Striving to create a great cup of coffee at home was always a passion for us. Living in a small town in North Carolina didn’t make it easy. The nearest source of “quality” coffee beans is at least an hour away. That meant making sure we had enough beans on hand to get us through to the next trip to the big city, stocking up with deteriorating beans to make sure we didn’t exhaust our supply, or using institutional type coffee from our local grocery store until we could replenish our stock. Even buying beans from the gourmet shops in the big city didn’t guarantee a great cup of coffee. Who really knows how long the beans have been “aging” in those huge glass jars. We never could quite figure out how stock is rotated to make sure the bottom beans get to the top before they are past their “sell by” date. Since the coffee at these shops was so expensive, we usually went to the sale tables to get the best bargain. This meant we were buying the worst of the best…a “sell by” date that was historic. Trips to the famous corner coffee chain did not product better results. Having the most recognizable name in the coffee industry did not mean we would love the coffee. I know Starbuck’s is loved by millions (or billions) of people world wide; however, their coffee at home did not take us away to an exotic place in our minds. We also had the same travel problem; the possibility of a Starbucks in our rural community was as likely as a ski resort in the Arabian desert (or rather less likely..there is a ski resort in the Arabian desert). We tried coffee pods. We bought a top end Nespresso machine and really tried to love it. At first the coffee tasted wonderful; but then, as each cup tasted exactly the same, the romance faded. Keurig machines were out of the question; how could that possibly deliver a great cup of coffee. Then our world changed. We discovered the joys of roasting our own coffee. At first we were reluctant. We heard about the expensive machines, the smoke and smell of the process, and the difficulty of readily finding green beans. But, necessity and desire pushed us to a point of “damn the torpedo, full speed ahead”; we made the plunge. The expensive equipment didn’t stop us because we had a secret weapon, and AGA cooker. For those who are unfamiliar with AGA cookers, the concept wouldn’t make any sense. It’s a cast iron over system that is always on and always ready to use with no pre-heating. We saw the AGA as a “free” coffee roaster because it had been purchased almost 20 years ago. 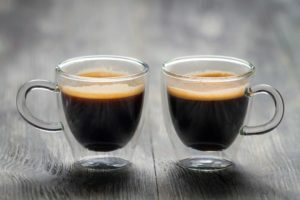 While it wouldn’t make sense to most people to purchase it just for coffee roasting, but if they considered all the other benefits…but that’s another story. Let’s just say the AGA cooker is God’s give to the cook. As far as the smoke and smell…well, you get used to it. Fortunately, with the AGA, most of the smoke goes outside for our neighbors to enjoy. The house does fill with a unique fragrance that’s an acquired taste (or rather smell). I think of it as the perfume of the gods. It’s just a bellwether of the fine smell of freshly roasted coffee that is yet to come. The final roadblock, availability of beans, took an interesting turn. After visiting a few local roasters to cajole them to see us green beans; and scouring the internet for sources (Sweet Maria is a good source), we hit on a gold mine. Costco sells two kinds of green beans. Being Costco, of course, means buying in quantity. They package the coffee in six three and half pound cans; so the minimum purchase is 21 pound of green beans. When we made our first purchase, we thought the lack of variety would mean a boring sameness in the taste. Our fears were unfounded; after purchasing this product at least ten times (do the math), we still believe this is the best coffee we ever tasted at home (or anywhere for that matter). It’s amazing, but the flavor is always different each time I roast it. Not drastically different, but just enough to excite our taste buds each time we have a cup of our morning coffee. Some may ask “ok that sounds good, but is it worth all the trouble?”. I answer “absolutely”! It takes about a half hour, once a week to produce this delicious coffee. Most the half house is waiting time so other things (like breakfast) can be done simultaneously. In effect, it doesn’t take any time. The beans are delivered to my door with just a few clicks. They cost about $4 a pound; effectively, that’s $5 a pound after roasting. Our goad is to minimize the amount of process food in our lives. If we can do this with minimum effort and great reward, so much the better. We we sit back and enjoy a great cup of coffee and we know that is is pure coffee, we have a certain sense of self satisfaction.